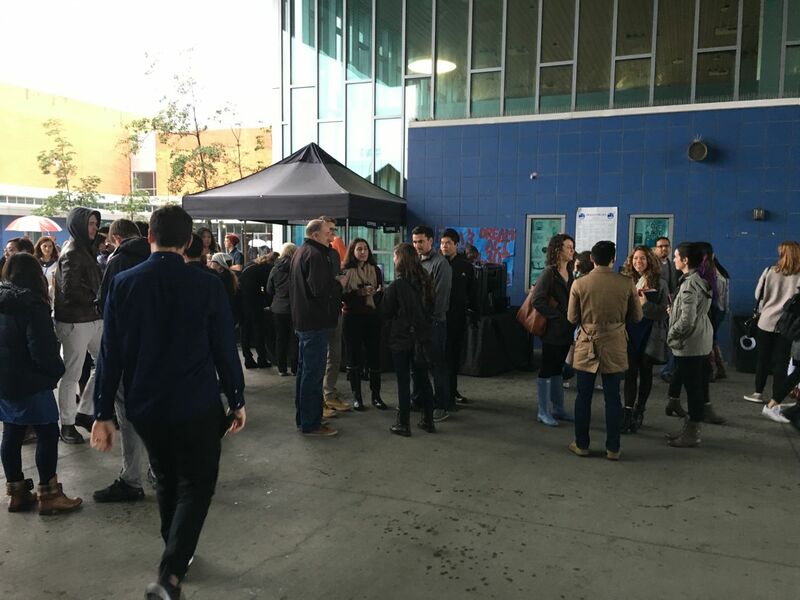 Sunday morning, one of those "new places" was Reality Los Angeles - a large, growing non-denominational church meeting in Hollywood. 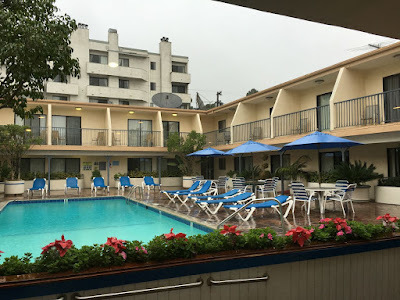 .... the Days Inn, Hollywood. Nice place, reasonable rates (for Hollywood). This is the view from our room Sunday morning just before checking out. As we drove down Sunday Blvd, we saw a sign for Saddleback Church, Los Angeles. 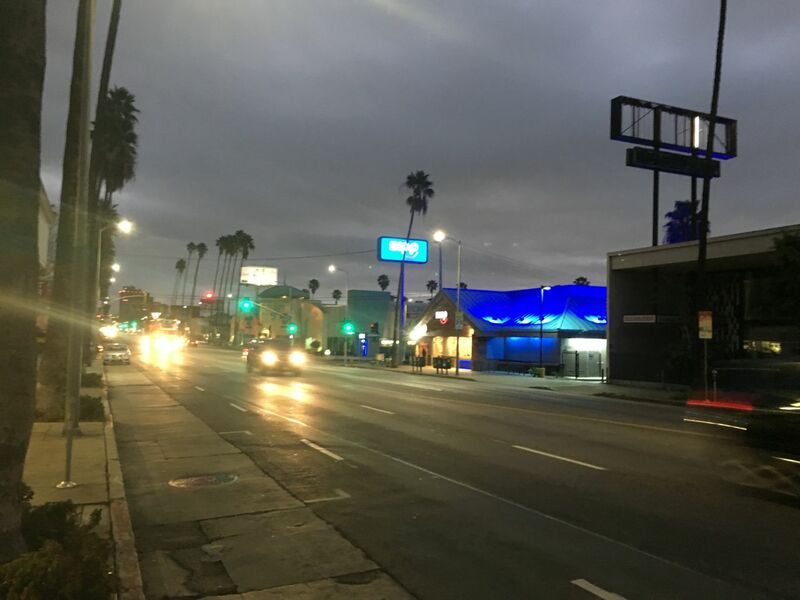 I just checked their website. 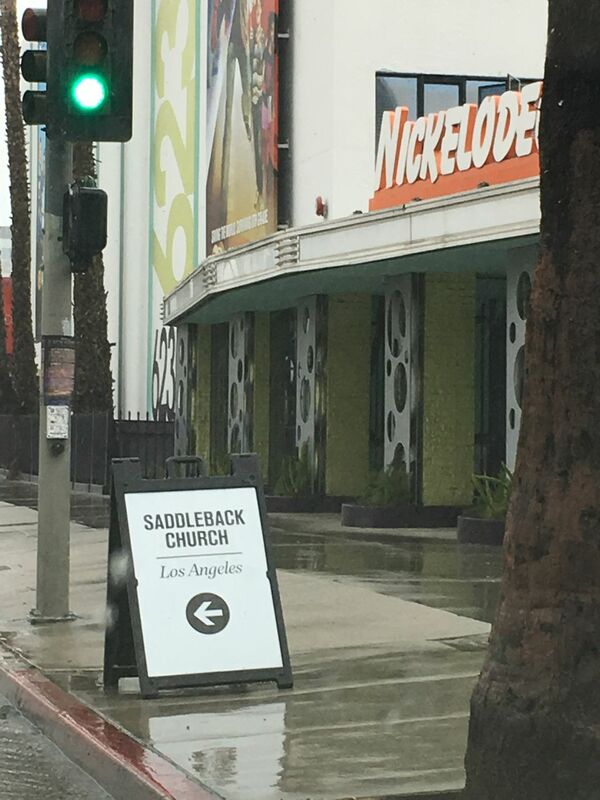 Apparently, Saddleback L.A. is meeting a few miles away in Studio City. 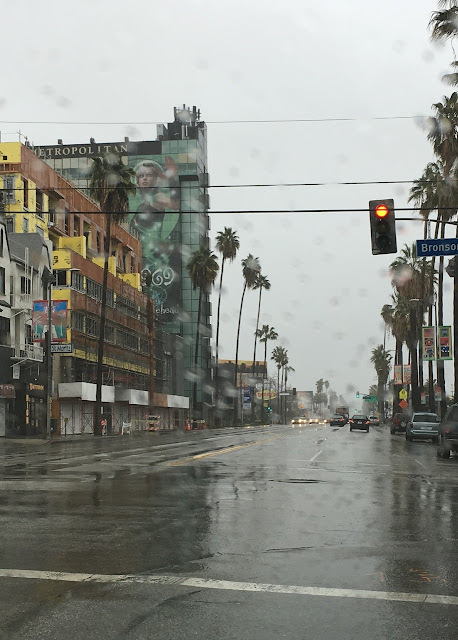 Sunset Blvd, Hollywood, Sunday morning in the rain. 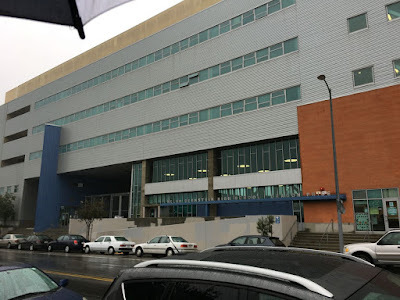 Reality Los Angeles - or just Reality LA - meets Sundays at Helen Bernstein High School 1309 N Wilton Place, about a block from where Sunset Blvd crosses over the Hollywood Freeway. 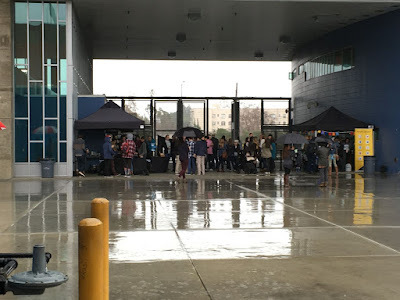 This being Los Angeles, nearby Paramount Studios has used Helen Bernstein High School as a filming location the TV show Glee. Los Angeles, like most other cities, rents out school facilities during "off hours" to groups and organizations - including churches and other religious organizations. Reality LA meets 9am, 12noon, and 5pm. 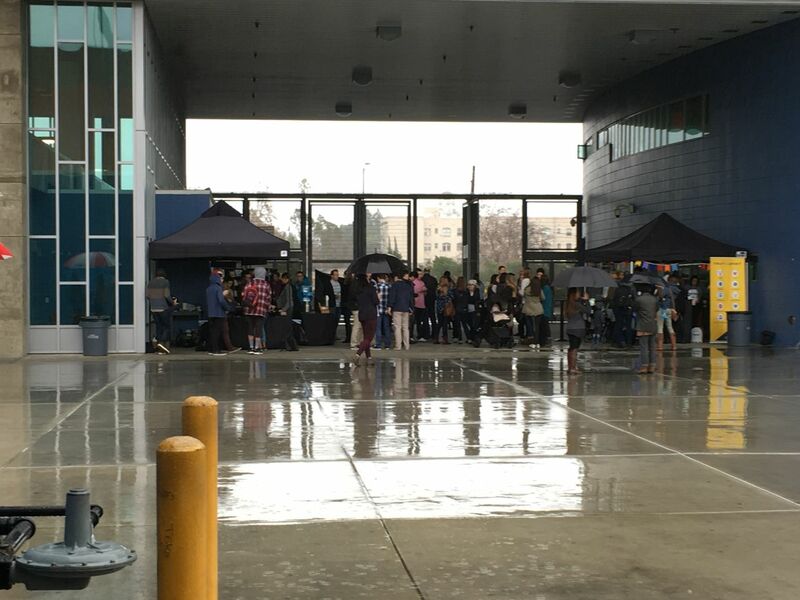 People hangout out in the courtyard - staying out the rain. 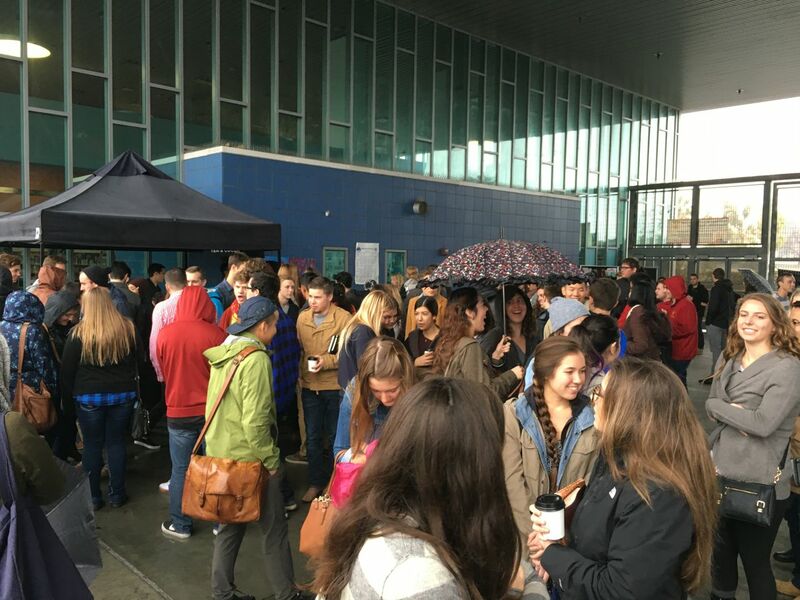 Every Sunday, dozens of volunteers work to set up (and, of course, tear down) everything involved in church services for a thousand or more adults, teens, and kids. Booths were up for opportunities for involvement during the week - including a dozen different service opportunities in the local community. 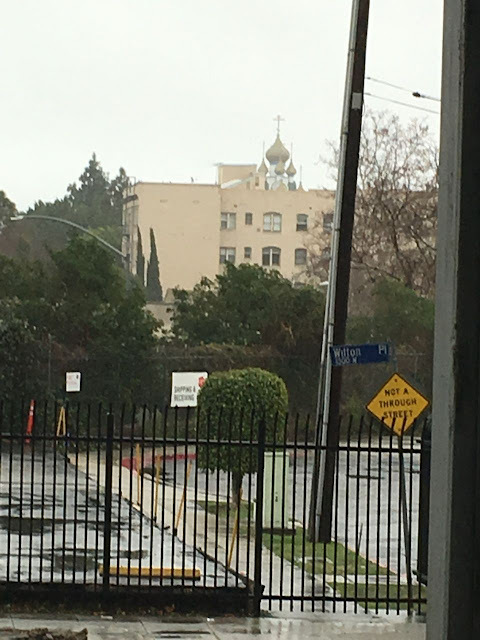 Just before we went into the auditorium, I notice off in the distance, the distinct onion domes of Holy Transfiguration Russian Orthodox Church - located half a mile away. 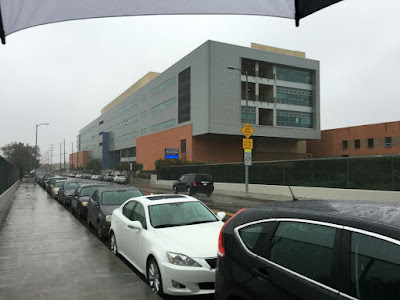 Here's a link with a few photos from a previous blog post. The sentiment that Angelenos don't go out when it's raining certainly wasn't true Sunday morning at Reality. 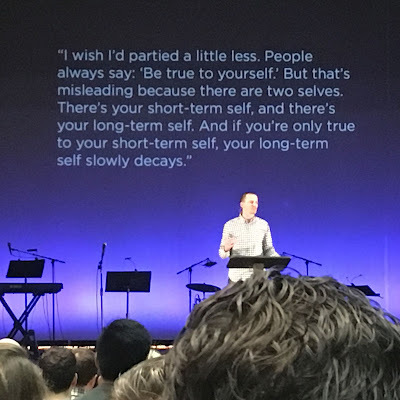 The church service was packed. 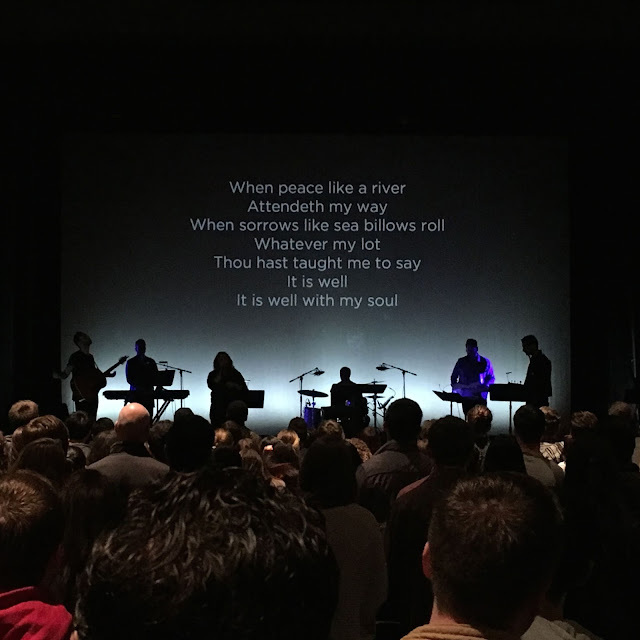 The service starts out with music and singing. The contemporary worship band was great. 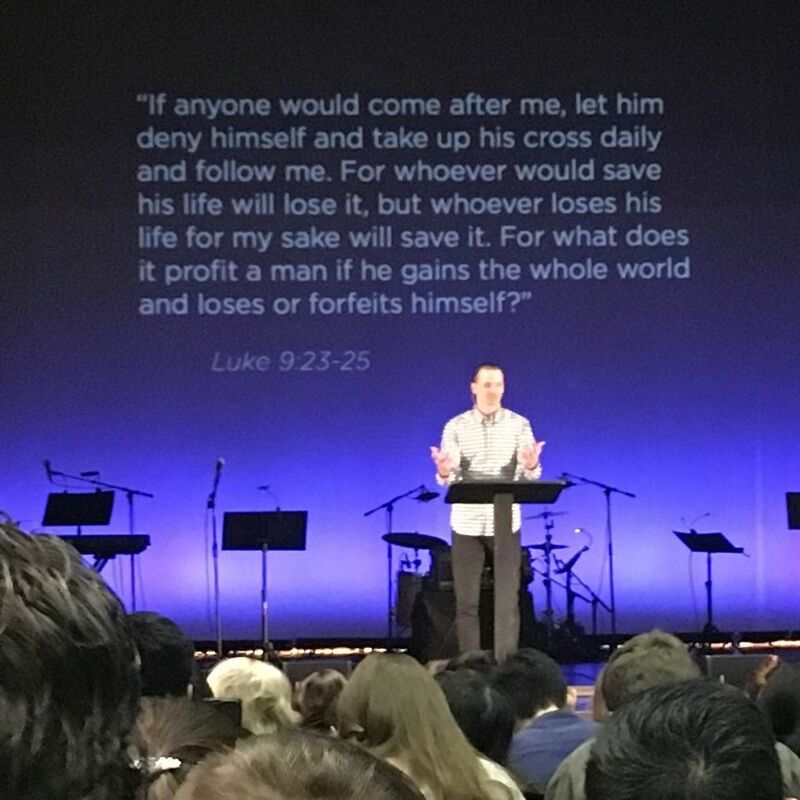 Great opening to an outstanding, engaging and - yes - challenging message. 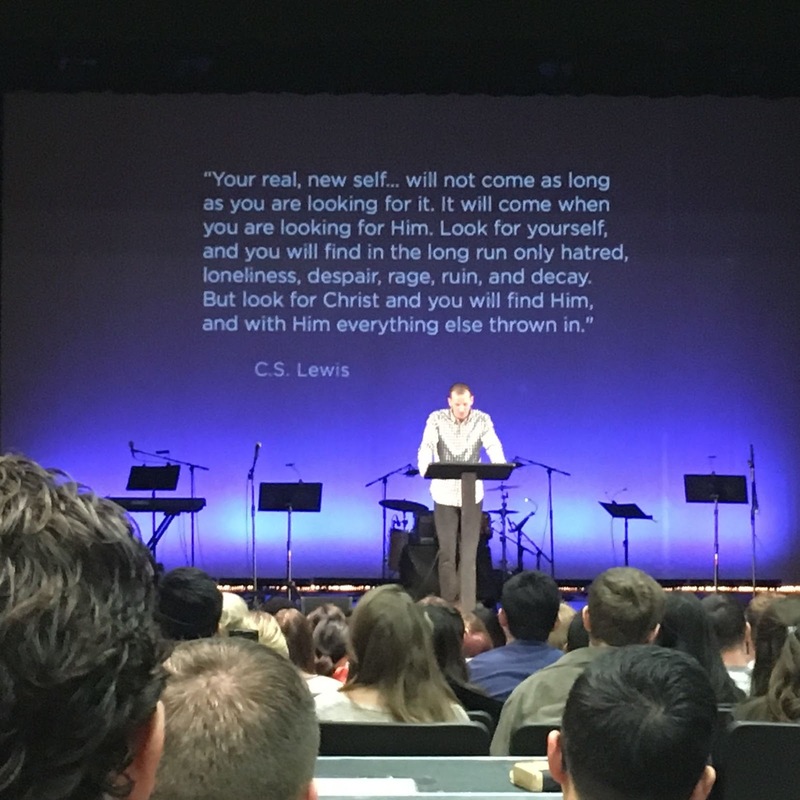 We loved the fact that lead pastor Tim Chaddick embraces the church's role and responsibility in a city like Los Angeles. 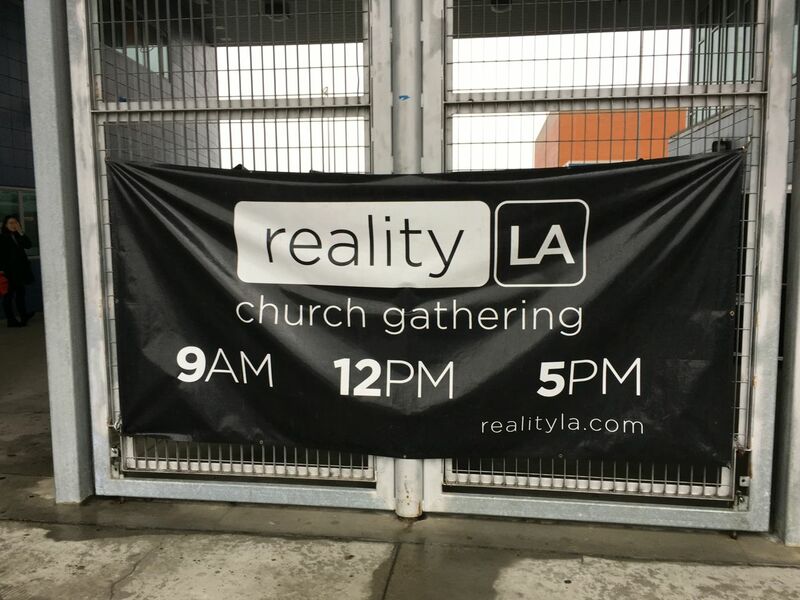 If you're looking for some sort of "me centered" religious experience - I wouldn't necessarily recommend Reality LA. But if you're looking for an authentic community of men and women committed to loving God, each other, and the wider community - this is the place to be. Great, challenging sermon. Even if you're not necessarily religious, or even a Christian, this church is still a great place to visit. People hanging out afterwards. Lots and lots of USC, UCLA, and other are university students. If my kids, now ages 16 and 14, end up at a university in Los Angeles - I'd hope they be involved in a church like this. Here's a link to the church's website. I'm taking a break from posting for a couple of weeks - more towards the end of next month.